To bring your personalized, marketing messages ideas to life, you'll need the help of a full-service provider with in-house printing and imaging solutions via cutting-edge equipment and technology. It’s More Than Just Ink On Paper. Combining 50-plus years of printing experience with investing in the latest technology, Design Distributors pairs traditional industry knowledge with innovative thinking and methods to offer unparalleled service and cost-effective solutions to meet your printing and imaging needs. By working with skilled graphic designers who have access to state-of-the-art equipment, you'll be able to turn your direct marketing ideas into reality. If you've ever seen a huge newspaper printing press in operation with large cylinders rotating and newsprint paper flying through in a fast, continuous stream, you've viewed a room-size example of a classic web press. Web presses are used for high-volume printing at a faster pace, producing large quantities of products in less time. 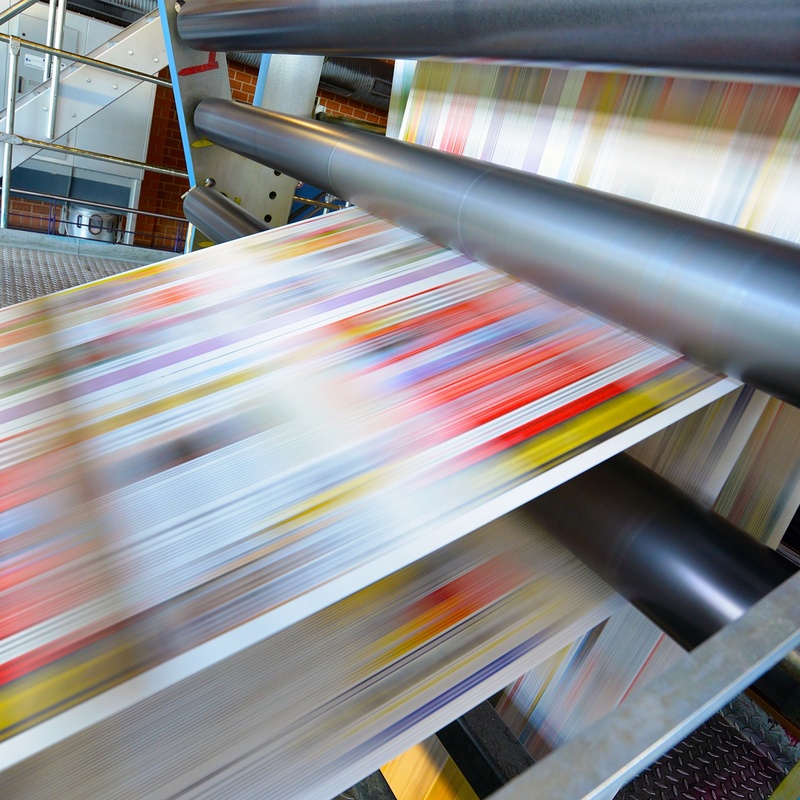 Web presses use several connected units for different functions, such as printing different colors of ink, symmetrically positioning print format, cutting, folding, and hole punching—all in line—so a finished product rolls off the end of the press, ready for distribution. This web press has the ability to print multiple variations of up to either 10 colors. It features in-line die cutting, remoist pattern gluing, scratch and sniff, applied scents, and can deliver either on a roll for lasering or sheets to fold and cut. Products are completed with uncoated stock and a matte/silk coated finish. Capable of running roll to sheet, roll to fold, and roll to roll. This press has the ability to print multiple variations of up to 8 colors. It features in-line die cutting, and can deliver either on a roll for lasering or sheets to fold and cut. Products are completed with uncoated stock and a matte/silk coated finish. The Didde Glaser uses 4 colors and runs roll to sheet. The press also includes in-line remoist and pattern gluing and 2 plow folding stations. Quality sheetfed presses make it possible to print brochures, specialty papers and order cards within tight schedules and approaching deadlines. Whether you need a six-color brochure, a two-color letterhead or envelopes lithographed on flat sheets and then converted, our sheetfed department is equipped to handle just about anything you require, regardless of complexity. The Mitsubishi Press contains 6-Colors with Anilox coater and extended delivery. Additional features include an auto-preset inking System (API-III), impression pressure presetting system, feeder and delivery presetting system, automatic ink roller wash, coater circulation system, and tower coater. This short run sheetfed press is reliable and sturdy with a quick set up time. As a 2 color printing press, it’s perfect for all multi-color and tight-register printing. Additional features include an infrared dryer and ultrasonic double detector. Our digital printing presses combine flexibility and affordability in order to give you endless options for your digital mail campaigns. With Design Distributors' digital printing services, you can instantly create branded merchandise from calendars and presentation folders to ID badges and POP displays—all from a catalog of ready to go stocks. These color production sheetfed printers offer toner-based imaging to create personalized output without slowing down workflow. Offering high-speed and high-quality digital systems that can handle print volumes of up to 1 million pages per month - each printer has a perfected automated finishing to ensure a professional look. This color production sheetfed printer offers toner-based imaging to create personalized output without slowing down workflow, with automated finishing to ensure a professional look. The Xerox IGen allows for quality and custom dimensional results without the setup costs. It finishes from matte to high gloss and has the ability to run specialty papers and pre-die-cut sheets from both Xerox and many other manufacturers. Max sheet size: 11" x 17"
The Xerox IGen can run up to 22"x14" sheets up to 18 pt. thickness and finishes from matte to high gloss. This printer also has the ability to run specialty papers and pre-die-cut sheets from Xerox and many other manufacturers, producing a quality finished product without the high costs. Max sheet size: 14” x 22"
You're going to want a wide range of envelopes in various sizes and colors so you can choose the best possible option for your next marketing campaign. Design Distributors has a vast knowledge of envelope printing and manufacturing and focus on delivering you quality that's beyond comparison. The HaIm Jet Presses presses can imprint in pre-manufactured envelopes in a variety of different sizes and configurations. Up to 9" x 12"
Electronic presses combine traditional printing basics with state-of-the-art technology, producing unique mail that breaks through clutter and truly stands out. By switching visual information into digital form to output film for printing, these presses make for a faster, better, and more cost effective process and distribution. Today, laser printing is an industry standard due to its ability to create quality prints at a faster rate for less money. Some of the many benefits of laser addressing include avoidance of errors, flexibility with a wide assortment of printing styles, impressive aesthetics and print quality, and an improved overall cost-benefit balance due to increased flexibility within a single piece of equipment. The PageStream 372 continuous form laser printer is equipped with an incredibly powerful and fast controller system lto allow for optimal functionality, speed, and performance. Additionally, the printers advanced paper transport technology enables both pinless an pinfed paper, giving way for wider print width and new paper-handling flexibility at a lower overall cost. (Standard) 240 and 300 dots per inch print quality with switchable multi-resolution mode. (Optional) 600 dots per inch quality with switchable multi-resolution mode. Designed specifically for higher capacity mid-volume print producers, the new Océ 2240 printer offers stunning print quality, versatility and reliability for both rigid and flexible media along with simplistic and precise media positioning. Additionally, this printer contains a low-energy UV curing system for printing on thin and heat-sensitive media. The IBM InfoPrint 4000is a high-speed, high-production, on-demand, continuous forms, all-points-addressable, duplex and simplex laser printing system. In addition to quality printing and production, this printer offers both high duplex and simplex throughput speeds. It also includes an Advanced Function Common Control Unit (AFCCU) designed for host-managed printing recovery, along with an enhanced toner loading system for exceptional productivity and overall page integrity.